Sarawak, Malaysia plays host to world leaders and captains of industry to unlock next phase of collaboration and growth against new economic order impacted by Disruptive Change. KUCHING, 13 July 2017 – The World Islamic Economic Forum (WIEF) is set to return once again to Malaysia, for its 13th edition; following successful rounds in Kazakhstan, Indonesia, Kuwait, Pakistan, the United Kingdom and United Arab Emirates. This year, the forum will be held at the Borneo Convention Centre Kuching, from 21 November to 23 November 2017. “Since its inaugural edition, the Forum has seen numerous trade deals and agreements amounting to some USD 13 billion[i] in the past five years alone. The 13th edition dives into ‘Disruptive Change: Impact and Challenges’ – a timely theme against the backdrop of a global landscape impacted by everything from shifting trade policies to technological disruption,” said Tun Musa Hitam, WIEF chairman. In its 13th year running, the WIEF has more than doubled the number of participating nations – with participants hailing from economies of all sizes. As a value neutral platform that brings emerging markets and advanced economies to the same table, the growth of this Forum underscores the critical importance of world leaders and captains of industry working together to unlock the next phase of collaboration and growth against a new economic order impacted by disruptive change. Proceedings for the 13th WIEF have already taken off with satellite events running up to the forum in November, with discussions held to address key vectors of growth opportunities for industry areas in Disruptive Science, Technology and Innovation, Halal Consumables and Services, Islamic Finance and Law, Arts, Culture and Design as well as Entrepreneurship and Emerging Spaces. 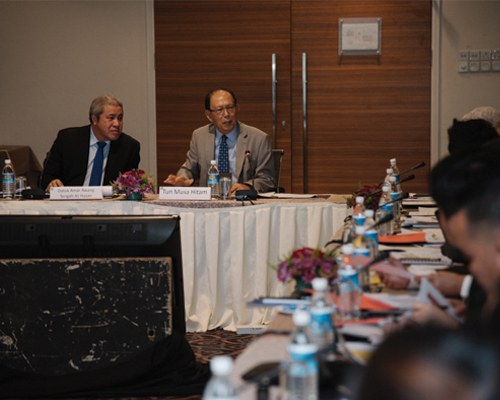 “As the global community moves to collectively tackle the many challenges that lie ahead of us, it is important to orbit our discussions around crystalised industry vectors that provide clear actionable insight for its participants,” added Tun Musa Hitam. WIEF has been steadfast in its advocacy for inclusive, sustainable and ethical growth through promoting regional cooperation, driving businesses and positively impacting communities. Through this Forum, current and aspiring industry players will have the opportunities to share their thoughts and insights on the impacts and challenges of disruptive change and craft a more sustainable and forward looking global business landscape. The 13th World Islamic Economic Forum is going to be held at Borneo Convention Centre, Kuching, Sarawak, Malaysia from 21 – 23 November 2017.